Marylou Paterson will do whatever it takes to get a child ready for school. As a result of her determination to help children succeed, she has worked as a nurse for over 45 years in four different states. After moving to Bend in 1989, Marylou served as one of Bend-La Pine Schools first district nurses. 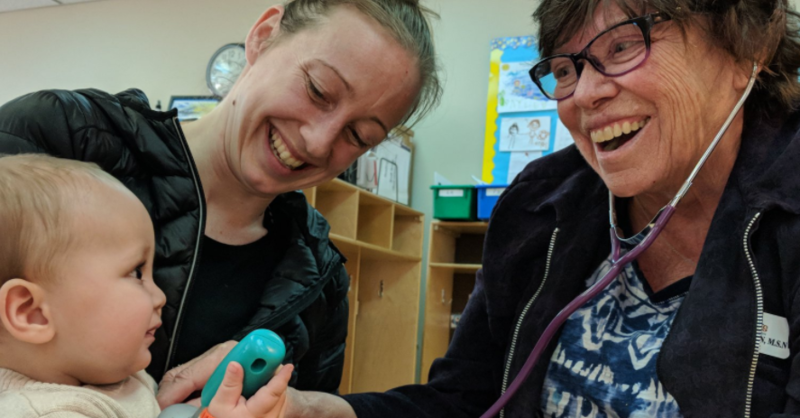 Oftentimes commuting from Tumalo to La Pine to help students in need, she did anything and everything from medication distribution to catheterizations. It was during this time that Marylou heard of Central Oregon’s Healthy Beginnings (Central Oregon) program through the High Desert Education Service District. With a shared passion for providing medical attention and advocacy, Marylou became a volunteer for Healthy Beginnings immediately after retirement to help provide free health screenings for children who have yet to enter school. Characterized by a kind demeanor, instant likability, and years of experience, Marylou is known for her ability to calm toddlers and preschoolers, connect with parents, and accurately assess needs. Besides providing obvious health benefits, screenings also foster and build community, as parents of young children have the opportunity to meet and support each other. Similarly, Healthy Beginnings is designed to work alongside other advocacy organizations by providing more time for check-ups in conjunction with other pediatric appointments. In addition to these partnerships, Healthy Beginnings volunteers often boast years of experience which culminates in free health screenings from health professionals with diverse backgrounds and expertise. However, the volunteers often self-identify simply as professionals who just “love children.” In Marylou’s own words, “The best parts of volunteering are the moments with the little tiny babies,” and thanks, Healthy Beginnings screenings, these babies are later able to enter kindergarten prepared — something that only 60% of most Oregonian kindergarteners are equipped to do according to Oregon Learns. Besides attending screenings, Marylou also recommends that parents help their kids by substituting time in front of electronics with human interaction and encouraging healthy lifestyles early on. Having worked with hundreds of families and children over the course of an impressive career, Marylou knowingly acknowledges that, “parenting is the hardest job there is, and anything we [Healthy Beginnings] can do to help is worth it.” Whether that means eye checks, nutritional education, or both, Marylou and other volunteers like her are dedicated to helping the children and families of Central Oregon the best way they know how.